It came as a shock to most people who watched the nightly news on a major network last night: new CDC-phone-survey figures show that one in 50 school-aged children now has an autism diagnosis. To our audience who live with autism on a daily basis either as a parent, as one of the millions of caregivers worldwide or as someone on the spectrum themselves, it was just an acknowledgement of something they already know. To many, it also was fuel to reignite one of the many major core debates this community argues every day. How much of the new figure is mere acknowledgement of previous unrecognized spectrum disorder; how much is the result of a new causative factor that appears to be balloning? What is that factor, and what’s being done to identify it? Everyone with an agenda went to the methodology page of the report and teased out the numbers that support their beliefs, and that only served to support our beliefs at The Autism Channel that there’s a missing piece in the autism media. That is why we think the missing piece in autism media is a video news program where major stories like the ones reported this Wednesday evening can be given the time and attention that people in the community would like to see them receive. Our audience wants specific details that wouldn’t keep the attention of typical nightly news viewers. They know the players in the autism community and want reaction that would make little sense to people outside it. 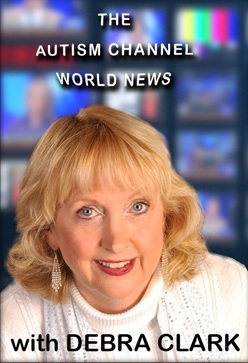 We want to provide that kind of coverage, and soon we will, when we launch The Autism Channel World News. From the first day we conceived the Autism Channel, we knew a daily news program needed to be a major part of the program offering. It was just more difficult than we imagined to find the right host, and to develop the sources to provide the material to support it. We’ve now done that, and we only wish that we were in production now to cover those major stories. We know, of course that there will be tens of thousands more. Our news anchor is Debra Clark. She’s the mother of two teenage boys with Asperger’s, was named Millennium Woman of the year in 2001, is seen on Southern California’s Fox 11 News as an advocate for adopting rescue dogs. She’s also on the spectrum; recently diagnosed with Asperger’s herself. She will preside over a news organization committed to delivering current, complete coverage of autism and the autism community, free of the bias that comes with the need to support an agenda. We will not be afraid of saying “We don’t know.” Because our channel has taken no position on causation, treatment options or political action, we are free to report the news no matter whose ox it may gore. We think that has been missing in this community for a long time, and we hope it can be one of the most important things our channel can add to the many voices in the autism community. Next PostNext We’re aware, already!